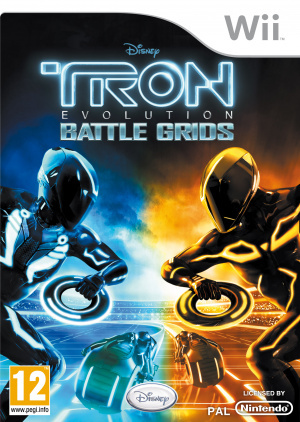 Sorry, no review of Tron: Evolution Battle Grids yet. TRON: Evolution - Battle Grids for Nintendo Wii is an action-packed game set in the combat arenas and cities of the TRON universe. Grid Games – Play thrilling TRON inspired arcade games including Light Cycle Racing, Light Disc Battles, Light Runner Combat, and Hyperball! Championship Mode – Create your own customized party mode and battle for the ultimate prize. Story Mode – Explore a unique story mode on your quest to become the Grid champion. Multiplayer – Compete against your family and friends in up to four-player local multiplayer events on the same Wii. Character Evolution – Create and customize your own TRON program and become a legend on the Game Grid! I'm going to see the movie and play the game. Movies and games? Not a good combination. Still, admittedly it does look awesome. I'm annoyed that we don't get the same version as the XBOX360 and PS3 though. After watching the vids for this and for the HD version, I honestly think this looks a lot more fun. The light cycles in this look spot on, whereas the HD ones look sluggish and, well, boring. Battle Grids seems to have more of the old school TRON feel to it, which I'm really digging. wow. one wii port that might actually be kinda cool. I actually love this game a lot!